I am usually not a fan of seafood flavored ramen. They often come out tasting like aquarium water. However, seafood soups are a staple of Chinese and Korean cuisine and so the neverending array of artificial seafood flavored instant noodles continues. 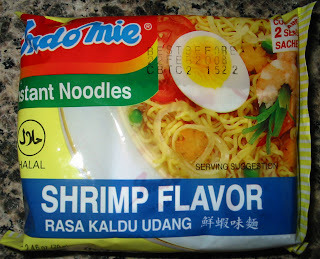 This pack is from IndoMie and is called the Rasa Kaldu Udang flavor. Conveniently, they also translated the name into English (something that they don't always do on their packaging). Indomie's most popular offering by far is their Mi Goreng. This is for good reason, since the flavors are extremely well executed, with 4 or 5 unique spice packets, depending on your variant. The shrimp flavor, on the other hand, only has two spice packets, one for chili powder and one for the shrimp flavoring. 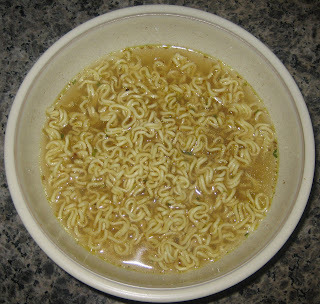 Unlike the Mi Goreng, the shrimp flavor instant noodles are served in a broth. 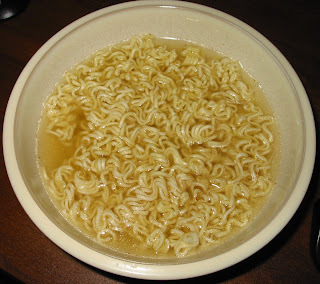 The Indomie noodles are plain and typical instant noodles. They aren't particularly flavorful since they are usually served with an intense sauce in the Mi Goreng. Here, the shrimp flavor is nice and subtle. It definitely tastes artificial, almost like the manufactured shrimp flavor in Maruchan's shrimp noodles. I was appreciative that there was no aquarium water taste, but overall unimpressed because I have so often seen Indomie do incredible things with their flavor combinations. I don't think their noodle soups are very good, so I would recommend to stick to their dry noodle products like Mi Goreng and Mi Goreng Rasa Baso Sapi. Artificial chicken flavor seems like an odd thing to proudly display on the front of a ramen package. Since its flavoring comes in the form of a dried powder, it seems safe to say that the chicken flavor is artificial. 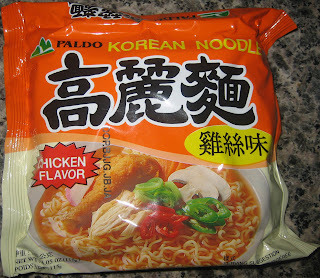 Why not just say "chicken flavor" like every other pack of ramen? 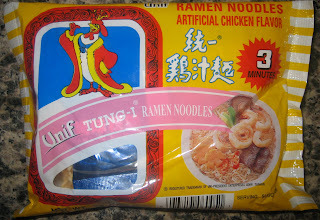 If a pack of ramen is artificial chicken flavor, why would it have a picture of shrimp and fish cakes on the cover? These intriguing questions drove me to pick up this pack at the local 99 Ranch Market to try out. The noodles themselves were very thin and did have a light nutty flavor. They were pretty typical Taiwanese noodles in that they seemed to be thin and fried a little bit longer than other styles of instant noodles. The broth really didn't taste like chicken at all. Instead, it had a light taste of sesame and salt. It wasn't unpleasant, but certainly lacked distinctive flavor. These noodles do soak up an impressive amount of water, so be sure to add enough to leave you with some broth. I had to add a little extra at the end to accommodate the "soak factor". This is about as unassuming as they come. The noodles are thin and flavorless and the broth is about as simple as can be. There is nothing bad about these noodles, they are really just nothing special. I would recommend skipping them unless you are also intrigued like I am by the concept of "artificial chicken flavor". Paldo competes in the very crowded Korean instant noodle market. Here in the US, the Paldo packs tend to be a little cheaper than the analogous Samyang or Nong Shim offerings. I had a friend in college who relied on cases of Paldo for subsistence; it was still cheap and the flavor was better than the ultra-cheap American ramen. The Paldo noodles are thick and chewy like most Korean instant noodles. The pack also contains a lot of noodles: 120g to be exact. There were some strange flat orange squares of textured vegetable protein which I found quite repulsive. I really don't know why Paldo decided to include these, since they were completely out of place and tasted funny as well. The broth tasted just like chicken broth. Nothing exciting, just the flavor of salt and chicken. There were some scallions and dehydrated carrots in the broth, but I couldn't stop being disgusted by the protein squares. There really wasn't anything remarkable or memorable about these noodles so I wouldn't recommend these. I would recommend going with Nissin Demae instead. This pack of noodles is made by Indomie and is imported from Indonesia. 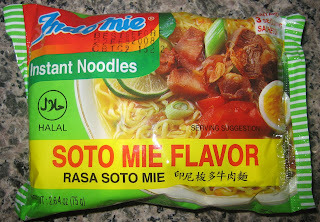 The flavor is "soto mie", which is a type of noodle soup common in Indonesia. I don't know too much about it, but Wikipedia's page has a little bit more information on Sotos. 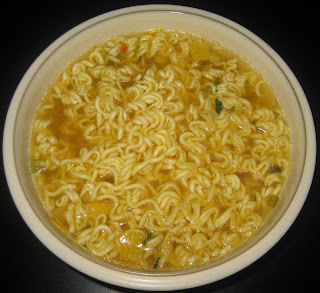 Indomie's instant noodles usually have very strong and complex flavors. I am not familiar with Indonesian cuisine at all, and the closest thing I can think of to Indomie's flavors in general is Thai cuisine. They are usually a mix of spicy, sweet, sour, and salty all in one. With that said, I was surprised to discover that this packet had a relatively simple flavor. The broth tasted mostly of lime with a little spiciness and a curry taste, probably from turmeric. However, it was mild to the point of being bland and wasn't a particularly savory or interesting flavor. The noodles themselves were also boring. Much less flavorful than the typical Japanese and Korean noodles, these were bland and did nothing to improve this dish. I never noticed how bland these noodles were in the past, because they were always coated with Indomie's superb blend of sauces and spices in Mi Goreng Rasa Baso Sapi and Mi Goreng. While those were delicious offerings, I would suggest staying away from this one. You might enjoy it if you enjoy the original dish on which this is based. 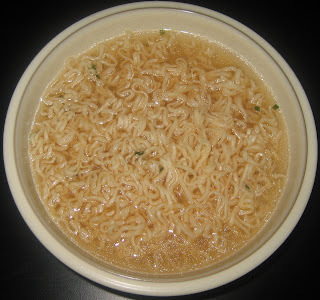 It remains to be seen whether or not any of Indomie's noodle soups are good, or whether they only excel at dry noodles.